A multi-talented convention favorite, Chris Tang is an accomplished game designer, cosplayer, and gaming tournament champ. He's best known as the Sega World Champion from the "Rock the Rock" $25,000 Sonic & Knuckles competition on MTV, but it was becoming a Nintendo World Championships City Champion that helped him get his start in the game industry. He's since contributed to titles such as "Street Fighter III: 3rd Strike", "Marvel Vs. Capcom", "Transformers", "Gauntlet IV", "Primal Rage", "Primal Rage II", and "Tetris", working on everything from game design and implementation to story writing, voice directing and voice acting. Chris is currently the co-creator and Senior Game Designer on the tentatively titled "Flight Armor Project: STRIKE HARBINGER", first teased at Saboten Con 2015. A spiritual successor to the high-speed rail shooters of the arcade era with a strong anime influence, you'll be able to play an exclusive pre-release demo of it in the Saboten Con 2017 video gaming area! As a cosplayer, Chris has won over 40 awards in competition, with appearances in magazines and on TV. Highlights include: Hero Suit Barnaby Brooks Jr. from "Tiger & Bunny", Battlized SPD Red Power Ranger, Transforming Autobot Smokescreen WRX, Gundam Epyon, Sportacus, and Captain Commando. Though his creative focus has shifted towards game development, he's looking forward to creating characters and costumes that will be especially fun for cosplayers in the near future! Chris is featured in films such as the award-winning "Ecstasy of Order: The Tetris Masters", and appears as a cosplayer on HBO's hit TV series "Entourage" and on various "Tiger & Bunny" video releases. In 2016 he was invited to join the U.S. National Video Game Team, and will be inducted into the International Video Game Hall of Fame in Ottumwa, Iowa later this year. 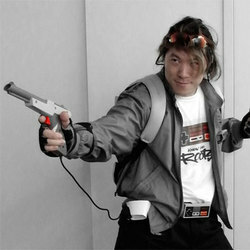 He is also the emcee for the Classic Tetris World Championships ongoing since 2010, and the voice behind the "BOOM! Tetris for Jeff!" meme that's been going around lately.